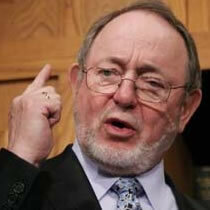 Anchorage, Alaska - Federal investigators are examining whether Alaska Congressman Don Young accepted bribes, illegal gratuities or unreported gifts from VECO Corp., Alaska's largest oil-field engineering firm, people close to the case said. From a Democratic Congressional Campaign Committee press release: A senior House Republican has come under criminal investigation in the Justice Department's widening inquiry into alleged influence-peddling and self-dealing in Congress. The News: Rep. Don Young and Sen. Ted Stevens are under investigation in a continuing criminal probe of alleged political favors for an Alaskan company. The Details: Federal investigators are examining whether Rep. Young or Sen. Stevens accepted bribes or unreported gifts from Alaska's largest oil-field engineering firm, people close to the case said. The Significance: The lawmakers are among the highest-ranking members of either party to come under scrutiny in the wave of public-corruption probes that has swept Washington. Rep. Don Young of Alaska, the former chairman of the House Transportation Committee, now is the subject of a continuing criminal inquiry involving possible political favors for a company in Alaska, people close to the case said. Sen. Ted Stevens of Alaska, the powerful former chairman of the Appropriations Committee and the longest-serving Senate Republican, is also now under criminal investigation, these people said. Federal investigators are examining whether Rep. Young or Sen. Stevens accepted bribes, illegal gratuities or unreported gifts from VECO Corp., Alaska's largest oil-field engineering firm, people close to the case said. It isn't known what VECO allegedly may have received in return. The company has been awarded a series of federal contracts since 2000, including contracts to provide logistics support for arctic research, among other projects. The two lawmakers are among the highest-ranking members of either party to come under scrutiny in the wave of public-corruption probes that has swept Washington in the past three years. In the past year, two congressmen have been sent to prison, a third has been indicted for bribery, and at least a half-dozen others are under investigation in separate cases. For a decade, former VECO Chief Executive Bill Allen has held fund-raisers for Mr. Young in Anchorage every August, known as "The Pig Roast," participants said. Public records show contributions to Mr. Young of at least $157,000 from VECO employees and its political-action committee between 1996 and 2006, the last year the event was held. Mr. Young amended his campaign-finance filings in January to reflect $38,000 in payments to Mr. Allen, who is now cooperating with federal investigators in the case. The refunds, which haven't previously been reported, were labeled "fund-raising costs" in documents filed with the Federal Election Commission. Mr. Young has hired a criminal-defense team and has said his campaign committee has paid $262,000 in legal fees in the past three months. A spokesman for Mr. Young declined to comment on any possible investigation and wouldn't say why his legal fees have risen sharply. Mr. Young has also faced questions about campaign donations received from convicted lobbyist Jack Abramoff. The congressman wasn't previously reported to be under criminal investigation. The burly, bearded congressman has been Alaska's sole House member for 18 terms. He is perhaps best known as the architect of the "bridge to nowhere," a project in a massive 2005 transportation bill that he named after his wife, Lu, and "stuffed like a turkey," as he put it when the $286 billion bill was done. The proposed bridge to a sparsely populated island off Ketchikan, Alaska, came to symbolize out-of-control congressional spending to fund pet projects by lawmakers in both parties. It has been widely reported that VECO is at the center of a federal investigation of corruption in the Alaska state legislature. But the inquiry into Mr. Young, as well as details of the allegations against Mr. Stevens, haven't previously been known. VECO was acquired in June by CH2M Hill, a closely held Colorado engineering firm, after Mr. Allen, VECO's former CEO, agreed in May to plead guilty to charges of bribery, conspiracy and extortion. Mr. Stevens has publicly said that he was asked to retain documents related to the federal investigation of his son, Ben Stevens, and other members of the state legislature, and related to VECO's role in the remodeling of a family home in Alaska in 2000. Sen. Stevens recently hired a criminal-defense lawyer. He has said he isn't a target of the Alaska probe and hasn't violated any law. VECO executives, including Mr. Allen, have been big supporters of Mr. Stevens as well. And while VECO has won a string of federal contracts in recent years, it isn't known which contracts are the focus of the investigation. Mr. Stevens was directly involved in funding contracts with the National Science Foundation, for example, which went to support arctic research. But there is no evidence he sought to influence the award of contracts to VECO, officials at the NSF said. Congressional records show that Mr. Stevens on several occasions added extra funding to the budget for arctic research above what the agency sought. Sen. Stevens's spokesman, Aaron Saunders, declined to comment on the broader public-corruption investigation. The senator, in a statement, said: "This investigation should proceed to its conclusion without any appearance that I have attempted to influence its outcome." He added that the process should proceed "so that all the facts can be established." The government's wide-ranging investigation of corruption in Alaska has already snared three current or former state legislators, who were arrested earlier this year, as well as Mr. Allen and a second VECO executive. Ben Stevens, Mr. Stevens's son, hasn't been charged in the case. His office was raided by agents of the Federal Bureau of Investigation last fall. The investigation is being led by the Justice Department's public-integrity section, which is presenting evidence to grand juries in Washington and Anchorage. In the raid of Ben Stevens's office, documents related to VECO's gas-pipeline work were seized, along with records of his work for an Alaska fish-marketing board, an entity that was created and funded by Congress with support from his father.